What are the best Umbrella Strollers with Basket? Umbrella strollers bring great ease to parents because it allows the children to be comfortably seated throughout the day, especially during long walks and errands. The parent doesn’t have to carry the child or walk slowly to his/her pace. Strollers are very convenient as tired children can nap, while their parents shop, pay bills, or visit the vet. If both parents and children are going to be out for a few hours, parents need to pack a whole lot of things for the kids’ needs. These include milk bottles, diapers, a change of clothes, water, snacks, toys, etc. It would be greatly uncomfortable if the parents have to lug all these in a large baby bag and carrying their essentials at the same time. Good thing there are umbrella strollers meant for a long day of walking around and visiting new places or even doing errands. These umbrella strollers are made more efficient because of their wide and deep enough baskets suitable to carry all your children’s needs. What are some of the best umbrella strollers with basket? This lightweight stroller features a roomy mesh basket underneath the seat. It can conveniently hold all your baby’s stuff. It is durable enough for heavy items while still being lightweight for easy folding and transporting. This umbrella stroller is very travel-friendly, as it only weighs 12 pounds with compact fold. It features a one hand and self-standing fold. The seat offers multi-position reclining with five point safety restraints. The umbrella has a three-tier canopy for maximum coverage. It can hold the weight of a child up to 50 pounds. The appearance of the storage basket of this Jeep Cherokee umbrella stroller is very identical to the mesh storage of the Kolcraft. The mesh is equally roomy and sturdy and it is also a great companion for travelling due to its very lightweight nature. The seat has a five-point safety restraint and can be reclined for naptime. Both the child and the parent each have their own molded tray and two cup holders. The seat can accommodate a child weighing 50 pounds. This stroller is a bit on the expensive side because of its ultra lightweight components that are sturdy and durable for hours of daily use. It has a polyester twill material for the seats and sunshade with roomy mesh basket underneath the seat. The G-Lite stroller can be easily carried with one hand and has a folding mechanism that triggers quick-fold. The seat is padded and has a safety strap to hold your baby in place. The sunshade can be extended to offer more sun protection. The only downside for this stroller is that it can’t be reclined, so your child may have trouble napping. In any case, this is a good stroller for quick errand trips. 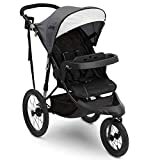 The Graco stroller is one of the best-selling umbrella stroller with basket on Amazon. It is rated 4.4 out of 5 stars coming from 204 customer reviews. 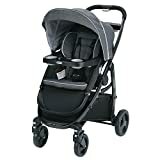 For the price, this is definitely a good buy as it compares with more expensive strollers that are around the $200 mark. The Graco stroller also has one of the roomiest baskets underneath the seat. The seat can be reclined to two positions only. It has a safety harness and a molded tray with cup holders. The only downside for this stroller is that it is a bit on the heavy side, weighing a little less than 20 pounds. This umbrella stroller is one of the most affordable strollers with good quality. It is also one of the lightest, weighing only 11 pounds. You can easily take it anywhere, making it great for frequent travellers. It has an easy to access basket that is roomy enough for your child’s needs. The stroller is good for kids weighing up to 40 pounds. It has a safety strap, molded tray, and extendable sunshade. It reclines up to two positions only. The downside is that tall parents might find this stroller too short. Basic weight of 12.7lb; Suitable for new-borns and children up to 55lb. 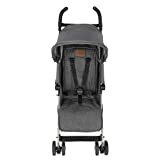 Maclaren strollers are known for their premium quality, hence the high price. If you’re willing to shed this amount, then Maclaren can be a great investment as you can rely to it to last for years to come. Your child may overgrow the stroller before it stops functioning. The basket of the Maclaren is not that big compared to the other baskets of the strollers listed here and it is also not easily accessible. However, the quality of the seats, the sunshade, and the wheels make up for this. It has multiple reclining positions and lockable swivel wheels. It is also very lightweight so you can take it easily almost anywhere. The travel basket of this umbrella stroller is superb because it is deep and wide enough to place a baby bag and more. You can easily place the free travel bag that comes with this stroller. It is also fairly accessible. The stroller is constructed greatly with travel in mind because of the lightweight materials used. The stroller can be folded with one hand and has a multi-position backrest for when your child needs a nap. The T-bar in front of the seat not only acts as a handle but it can be positioned to transform into a leg rest. However, it may only be suitable for older children who can sit upright on their own. There are many umbrella strollers with basket to choose from. You have to select whether or not you want something really big, just right, or narrow. 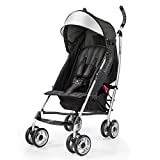 However, the main things to consider when picking the best umbrella stroller is if it is travel friendly, the seats are comfortable, safe, and can be reclined, and durable for long haul travels.